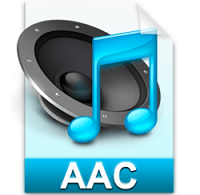 AAC, Advanced Audio Coding, is a lossy compression and encoding algorithm for digital audio. Designed to be the successor of MP3 format, AAC generally achieves better sound quality than MP3 at the same or similar bitrates. As part of MPEG-4 specifications, it is often referred to as "MP4 audio" for it is usually packed in an MP4 container. AAC supports great range of sample frequencies (8kHz to 96kHz), variable frame length and random bitrates, as well as multichannel (up to 48 channels). AAC is the default audio format for iTunes, iPod, iPad, iPhone, Youtube, PS 3, Nintendo Dsi, Nintendo 3DS, and DivX Plus Web Player. It is also supported by part of Android/Blackberry/Nokia/Windows phones, Sony Walkman Player series, PSP, Xbox 360, Wii, etc. Besides, AAC format is compatible with limited computer media players such as Windows Media Player, QuickTime, 5KPlayer, RealPlayer, VLC, etc. For people who own a large number of videos like MP4, AVI, WMV, MKV, MOD, MTS, etc and want to extract audio from the video to be saved in AAC for better playback on iPhone iPad as ringtone, you can rely on a video converter, like MacX Video Converter Pro, which is built in 370+ audio and video codecs and enables to convert any video to any audio, say MP4 to AAC, MP4 to MP3, WMV to WMA, and more. AAC claims an advantage over MP3 in sound quality: while MP3 requires a bitrate of about 256 kilobits per second (kbps) to achieve transparency, AAC can achieve the same quality at 128 kbps. In other words, AAC file sounds much better than MP3 at the same bit rate. Moreover, no MP3 file can surpass the AAC file at 256 kbps in terms of audio quality until now. AAC got improvement over MP3 in file size. In one hand, AAC and MP3 own the similar size at lower bitrate while AAC is much smaller in size at higher bitrate. In the other hand, AAC format is roughly half the size of MP3 files at the same quality because AAC file produces almost the same sound quality as MP3 file at double sample frequencies (kbps) does. AAC is less compatible than MP3. AAC is mainly friendly with Apple devices (iPhone, iPad, iPod, etc), Sony PS3/PSP, etc while MP3 works with almost all music players and all Apple, Android and Microsoft devices. In short, AAC format performs better in quality and file size than MP3 at the same/similar bitrate. But it refuses a few media players. To freely enjoy AAC music, you need a professional AAC player. MacX Video Converter Pro is an all-in-one AAC audio track extracting program with top quality and fast speed. This feature-rich music extractor also can help you freely download AAC audio track from 300+ online sites.